As far as new characters go, I’m loving those added to this edition of Street Fighter: Abel is strong and ranged, El Fuerte is fast and crazy, Rufus is, well…hilarious, and Crimson Viper fits well into the Street Fighter world. Chun-Li Thighs? Creepy and mannish. Apparently no one at Capcom can draw feminine arms/hands. Everyone looks like they have Trogdor arms. Everyone. Seth is a cheap fighter of the cheapest-cheapies variety. Unlocking stuff that already exists on a disc you already paid for is well and good if it’s easy to do. If it takes more than an hour, that’s not cool. 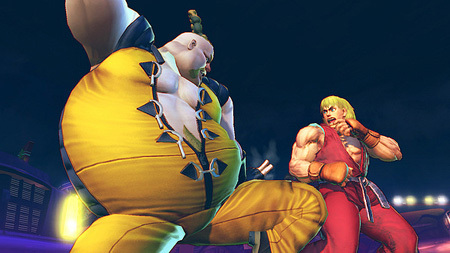 Very uncool, Capcom…very uncool. When I get old, I wanna be Gen.
My best character? Cammy. Yeah, who knew?